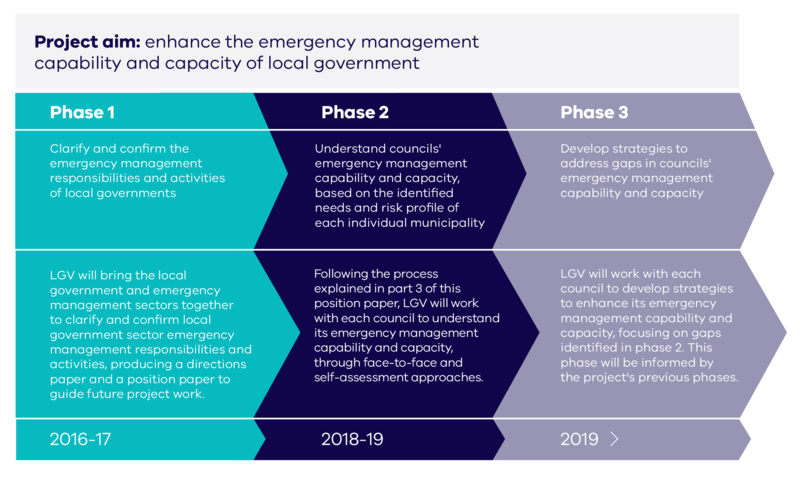 Local Government Victoria is leading work with the emergency management and local government sectors to enhance the capacity and capability of local government in emergency management. Consultation on the Councils and Emergencies project is closed. The project has now entered the second phase which involves working closely with councils to understand their emergency management capability and capacity based upon the Councils and Emergencies Position Paper (December 2017) and the Victorian Emergency Management Capability Blueprint 2015-2025. Contributing to capability enhancement strategy development. For project updates and further information please visit the Councils and Emergencies project webpage, or contact Local Government Victoria on (03) 9027 5805. What is the Councils and Emergencies project? The Councils and Emergencies Project is listed in the Victorian Emergency Management Strategic Action Plan as ‘Priority B: Enhance the capability and capacity of Local Governments to meet their obligations in the management of emergencies’. The project’s three-phase approach emphasises consultation with councils and the desirability of partnering with them and the emergency management sector in implementing the priority. Consultation on the Councils and Emergencies Directions paper opened. Consultation on the Councils and Emergencies Directions Paper closed. LGV analysed the feedback received from the Councils and Emergencies Directions Paper consultation to inform the development of the Councils and Emergencies Position Paper. LGV released the Councils and Emergencies Position Paper marking the completion of phase one of the project. LGV will work with key stakeholders to develop an emergency management capability and capacity assessment model. LGV will commence investigating councils' capability and capacity based on the developed assessment model. In conjunction with the Local Government and Emergency Management Sectors, LGV will develop strategies and plans to address capability and capacity gaps (phase 3).